You've heard the old phrase, "When life gives you lemons, make lemonade." But what happens when your friend gives you two big ol' grocery sacks full of lemons? While my first instinct was to make an enormous batch of lemon drop martinis, I figured it was better for my liver to find a Plan B. My second thought was to make a lemon meringue pie, but then discovered I only needed about 1/2 cup of lemon juice per pie so that would be a whole lotta pie . . . . So that's how I decided to makes preserved lemons. I know, it's so Martha Stewart of me! 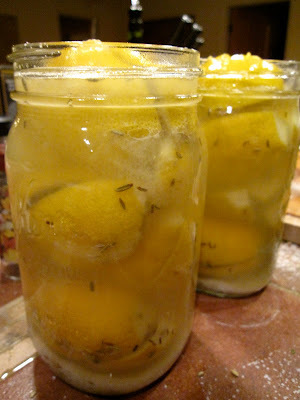 I'd come across a few recipes calling for preserved lemons of late but kept forgetting to look for them at the grocery store. I did a little online research and apparently the learning curve for making preserved lemons is pretty non-existent. While "putting up" vegetables or making jelly is a terrifying prospect to me, this seemed quite manageable. You basically just jam a ton of salt in between slits in the lemons, pack 'em in a quart jar, pour some fresh lemon juice on top, and then set them in a corner for 6 - 8 weeks. I don't have much of a green thumb when it comes to plants, so it's not unusual to find dead plants around my house. Even cacti don't last long under my watch. Watering them each week just seems like too much effort. I consider myself a very nurturing person but I guess I'm just not the cultivating type. But making preserved lemons is great because you basically have to do nothing to them once they're in the jar, and then *Shazam* two months later you've got these lovely golden gems! I was all patting myself on the back for all my hard work. Whatever. It was awesome. I highly recommend it the next time someone gives you a bag of lemons. And make this dish because it's awesome too. It's the moistest, tastiest chicken I've had in a long time. My friend, Meredith, came over to eat some. I took her cleaned plate as a sign she agreed. When you buy a whole chicken cut into pieces, you should have 2 breasts, 2 thighs, 2 wings and 2 legs. Because the breasts are so much bigger than the other pieces, I cut them each in half, cutting perpendicularly through the bone. Season the chicken pieces liberally with salt and pepper, and sprinkle with 1 Tbsp chopped fresh chervil. Heat a wide, deep saute pan over medium-high heat and when the pan is hot, add the oil. Place the chicken in the pan and sear until golden brown. Turn over and sear until golden brown on the other side and remove to a plate. Lower the heat to low and add the preserved lemons, garlic and zest of 1/2 lemon and 1/2 orange. Quickly stir them around and then add the white wine. Raise the heat to high and use a whisk to pick up all the pieces of crisp chicken from the bottom of the pan. Add the stock and season with salt and pepper. Add the chicken pieces back to the pot and when the liquid comes to a boil reduce the heat to low. Cover the pop and cook for 25 minutes. Remove the lid and cook uncovered for 5 minutes more. Mix together 1 clove finely chopped garlic, zest of 1/2 orange and 1/2 lemon, thyme, 2 Tbsp chopped fresh chervil and salt and pepper to taste. This is the gremolata. Take the pan off the heat and move the chicken pieces to a serving platter. Whisk 2 Tbsp of creme fraiche into the hot wine and stock. Then pour over chicken and top with gremolata. Serve over couscous or with crusty bread. I actually used Israeli couscous mix from Trader Joes that has lentils and garbanzo beans. It was perfect. Yields: 4 - 6 servings. In a bowl mix the spices into the kosher salt. Cover the bottom of an airtight jar with some of the salt mixture. Cut a cross into the lemons — almost to the base, so that the quarters stay together. Push the seasoned salt into the lemon segments and pack the lemons as tightly as possible into the jar. The less space there is between the lemons the better. Squeeze enough fresh lemon juice over the lemons in the jar to fill in any "air holes" and cover the tops. Screw the lid on the jar and put it away for 6 - 8 weeks. To use, remove a lemon from the jar and rinse thoroughly in water to remove salt. Discard seeds before using. Store in the refrigerator. These will last for about 2 years. Shhh! ;P Preserved lemons are one of those things that really impress people if you say they're homemade but having made loads when I worked as a cook, I know they're a cinch...but I like tp pretend otherwise hehe. So I made this but it looks like one of the jars has leaked and the water in the second one is sort of milky. Do I have to toss the whole lot out? I am super bummed. But of course I would be more bummed about botulism.